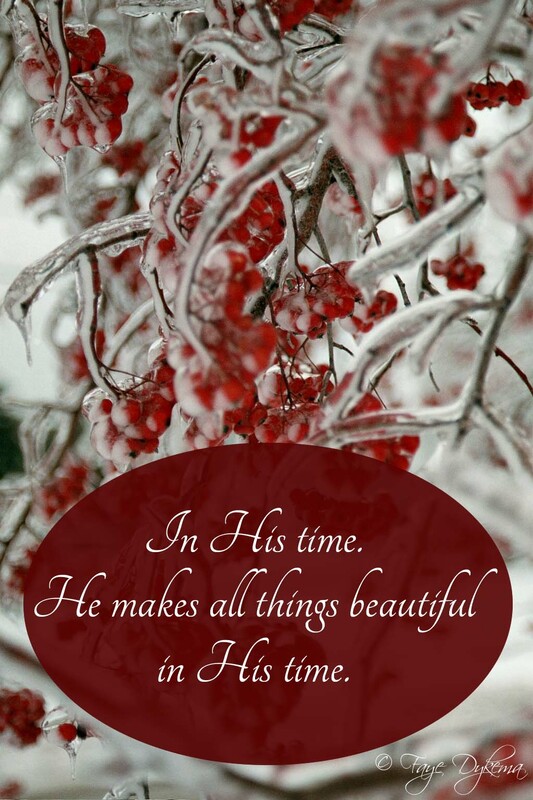 In His Time | God's Abundant Blessings! Time. For some a week, month or year are but a blink of the eye, particularly from hindsight. But for others time trudges on – waiting for test results, living with chronic or terminal illnesses, serving a prison sentence, or trying to understand what the future holds can all make time seem to stand still. In this world of all its worries and cares, there’s a simple little song that I find can calm my heart and bring me back to the perspective that God has all things in His control — In His Time. We must surrender and submit to God. The photo of the ice on the berries reminds me clearly of that. This photo was taken December 2007 following an ice storm in the Midwest. Little did we know the beauty of that ice would be the beginning of massive flooding in June 2008. The devastation of the flood was overwhelming for many. But now, three and a half years later, many of us have been able to see the “beauty” God has brought through those difficult times. My husband and I personally saw God’s hand in the provisions of friends opening their home to us for 12 1/2 weeks!, saving most of the “things” in our basement, getting involved in flood recovery, and precious new friendships with people whom we likely would not have met without God’s intervening. I can find myself so frustrated at waiting. How will I use my time and gifts that God has blessed me with? Sitting around seems like such a waste. But I’m finding more and more that in those waiting periods, if I am actively waiting and listening for God to lead and provide, He blows me away. What seems like delayed timing from my view is perfect timing from God’s viewpoint. The all-knowing, all-powerful, ever-present God, Creator of all things and Lord of the universe can never be late. The more I pour out my heart to Him, spend time with Him in prayer and His word and the more I intentionally bring my worries and concerns to Him, the more He shows me very clearly He IS there. He’s always paying attention. He knows intimately what we need. And if we keep looking for Him, He shows us clearly that He is there. Twice this week I had times of, “Ok God! I get it. You are paying attention to my needs and You do care.” Running my home business, I need to pay for the more expensive TurboTax software. Well, being more frugal these days, I’ve been watching the sales and Internet, but realized the local club store had the best deal. However, I thought I’d keep watching for something better. Thursday morning I woke with the clear impression to head over to the store for the software. I walked in, and they handed me a flyer. The store had an unadvertised $10 discount on that item for the next four days. I could have just accepted it as coincidence, but I’ve learned those are God moments. Friday I had an auto maintenance scheduled. As I pulled into the garage Thursday, the car made an awful noise. So Friday I spoke to the mechanic about it. The fan belt was cracked and showing signs of pieces coming off. Praise God I wasn’t out driving in country roads and stranded, or it broke and caused more damage, and that I had the appointment already. God even provided for the majority of the cost of the repair with a dental reimbursement check. Posted on January 27, 2012, in God's Blessings, Providence, Trust, Waiting and tagged Ecclesiastes 3:11, God's providence, Patience, surrender to God, waiting. Bookmark the permalink. 2 Comments.